Folic acid is vital during pregnancy. Foltabs provides a daily dose of 500mcg of folic acid which, if taken daily for one month before conception and during pregnancy, may reduce the risk of having a child with spina bifida/neural tube defects. There is an increased requirement for folic acid in pregnancy. Folic acid is required for healthy red blood cell formation and helps maintain a healthy circulatory system. Adult Dosage: Take 1 tablet daily or as advised by your physician. Foltabs contains no added sugar, gluten, yeast, salt, artificial preservatives, colourings, flavourings or sweetners. This product contains lactose. Store below 30℃. 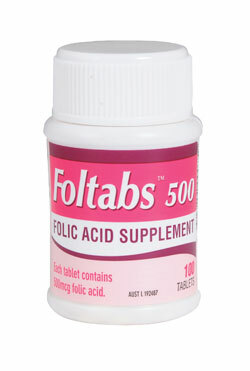 Foltabs is available in bottles of 100 tablets.